This Crease TWO is similar to the Blender PRO in terms of functionality; it can be used in the crease or all over the lid, to build or to blend out the application. I wanted a big crease/all-over eye brush but that would still allow control on the placement and the blending. It’s tapered but splays out to hug the crease and automatically blends as it builds intensity. Compared to the Blender PRO, this Crease TWO is going to build up the application just slightly more gradually, looking a bit more diffused in its perimeter, while the Blender PRO is going to give more opacity faster. It’s denser and firmer than similarly shaped crease brushes. This was a must as it helps especially when we struggle with heavier lids or more textured skin. The ferrule is curved, this is not only for aesthetic reasons but it contributes to the power of this shape. Pick the product, cream or powder, remove excess, either sweep all over the lid, target the transition, build depth in the crease or blend in circular or windshield-wiper motion. It’s a bigger version of the Crease Pro, similar type of curved ferrule so that it remains dense and strong at the very tip of the brush. The degree of it splaying out will depend on many factors, the technique you use, the washing products and method, if you dry it with a brush guard or not, but also other factors that are out of our control as I explain below. 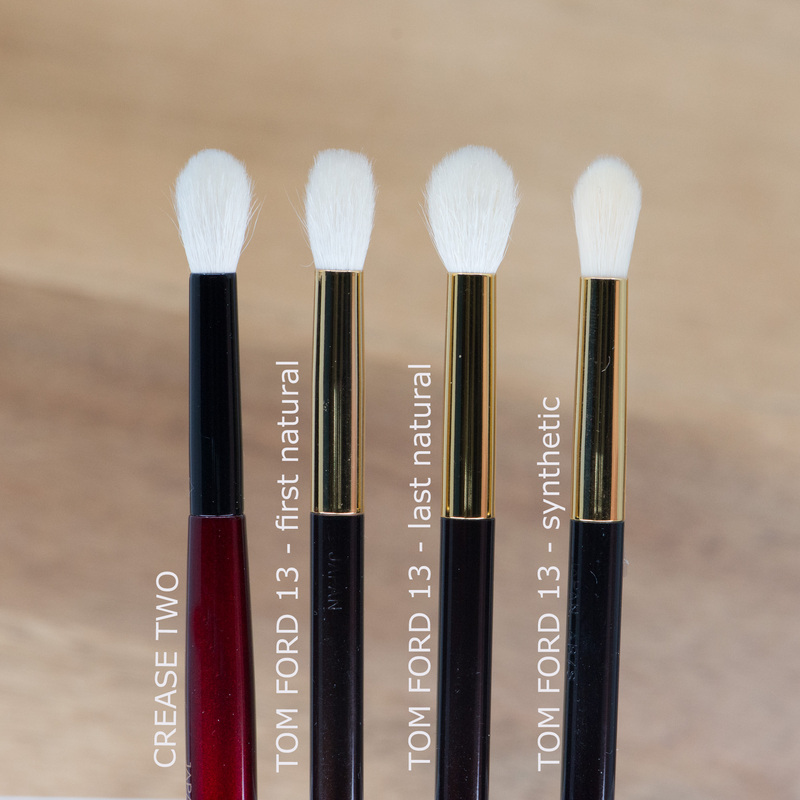 If you are a fan and familiar with the Tom Ford 13, this brush has gone through many production stages, starting quite tight and precise and then as batches were made it became wider and fluffier, mutating into a completely different brush as you can see below on my own TF 13. I have the very first batch and the very last batch of the TF13, it’s the same sokoho goat hair, the same specs and yet it’s different. So I asked the artisans, what exactly causes this evolution in shape. First of all, the batches of goat bristles are never going to be the same, the cuticles and the bristle thickness are going to alter the way a brush looks, all the natural sokoho TF 13 will feel or look slightly different. The brushes are handmade and there is an acceptable difference in either the ferrule or the hair length (tolerance I think they call it). Because it’s a small brush, any little difference is going to be more noticeable. The other factor is the artisan himself, when they bundle the brush, even when part of the bundling is done with the mould, it’s up to the artisan (the Fudeshi) to create the brush and each Fudeshi works with his very own personality and craftsmanship. 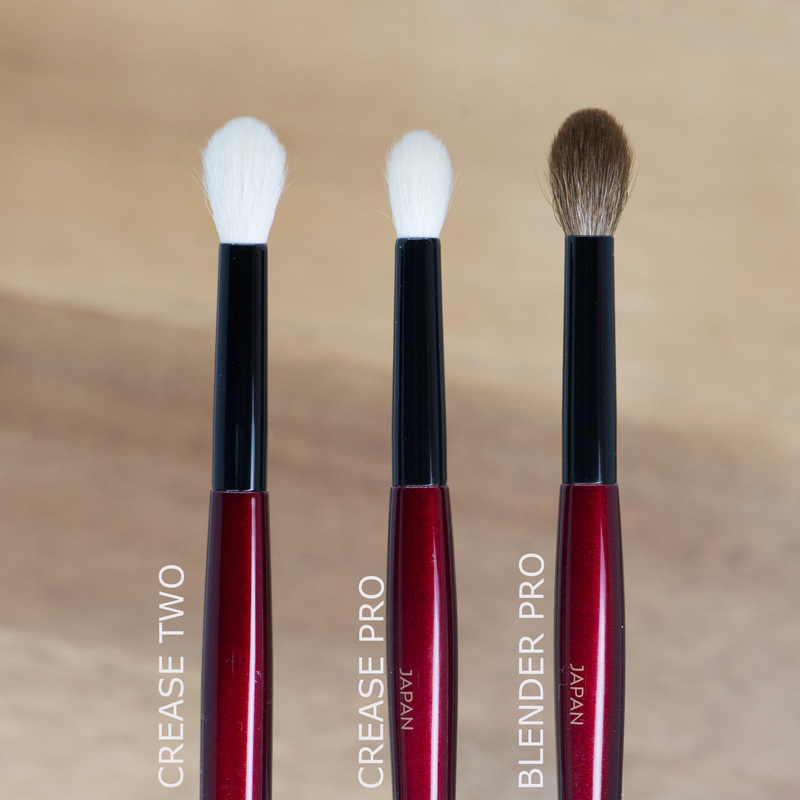 I am also taking a picture with other crease type brushes for you to see the difference in size but as a general rule, versus the brushes below, Crease Two is firmer and often denser at the tip, it may not feel as flexible and feathery soft but I was intentionally aiming for more control and strength. If you have any special request for comparison pics, do not hesitate to ask! 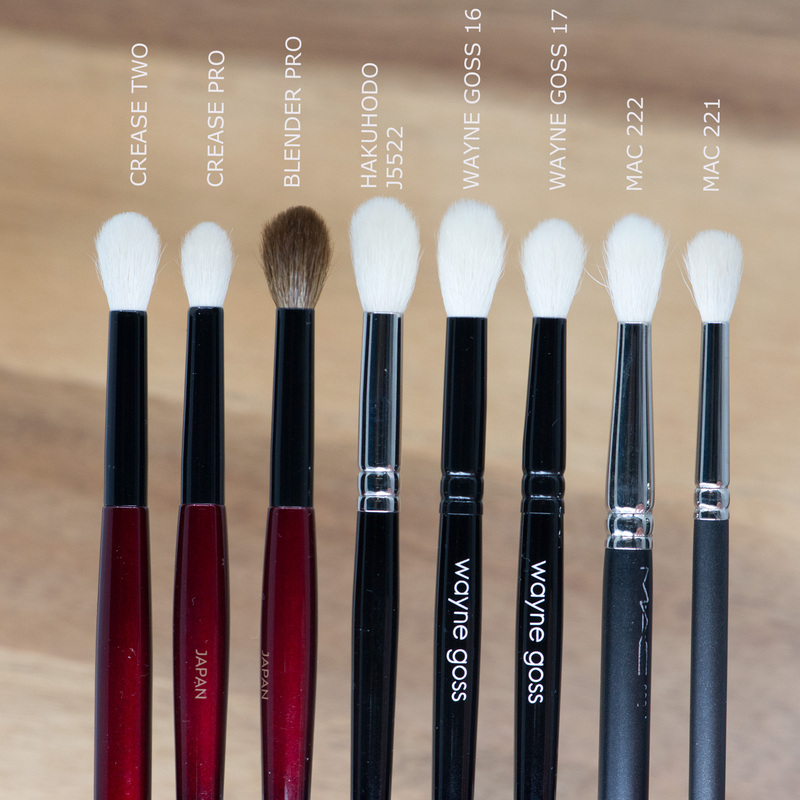 Somebody on Instagram asked me to compare it to the Mac 224 but I only have the synthetic version of this brush, I ordered the discontinued natural one and will be able to do this pic comparison in the near future! Blender Pro is stronger with the blending and the placement because of the cuticle that is altered with the dye and has more grip and thickness, therefore it will work with more determination. However, I curved the ferrule of the Crease Two in order to give it a more directional and firm shape which makes it still very strong, specially when we have “more skin” we have to be able to work with strength at the end of the tips (if we want to keep the control with the application). I have used brushes in the past that were too floppy or that would splay out too much and the product was not applied with enough intensity where I wanted and then it was skipping in some places, causing lots of fall out, etc. A more directional and firm brush solves these issues. Worker Pro will bloom more with time due to the way it has been bundled, to the ferrule and to the length of the bristles, but it still is quite precise compared to similar shaped brushes because mainly the bristles are shorter than similar brushes, this was a necessity because I want brushes that can work with asian and hooded eyes and these fit better the purpose. take care Denise, many hugs and Happy New Year! !